So much better when you know the back story. It's pretty obvious from the first moments of the first episode that this is a continuation of something, and if you're like me, it's quite possible you haven't seen season one, yet. After watching the first 5 episodes, the lack of character previous knowledge was bothering me. So, with a simple search, I managed to find season one, the first 12 episodes, on another site. Too bad Crunchyroll doesn't have it in it's library. So, I watched the first season on Hulu, with commercials, without having to subscribe. I wasn't looking for a new membership. After having season one fresh in my visual cortex, I returned here and commenced to start this over at show 1, and it makes SO much more sense now. Update: Crunchyroll added season one, you can watch it here. Great characters, good comedy, and massive delusions. Season 1 is a necessary precursor to watching this, but I'll try to catch you up. If you liked Steins; Gate because of Okabe Rintaro, you will likely enjoy this series as well. This is a story dealing with school kids who have big imaginations that gets them into awkward social situations when people don't humor their grand delusions regarding large conspiracies, secret plots, and super powers. The main protagonist has tried to repress his over-active imagination which is commonly referred to as chuu ni byou (lit. in the middle sickness, or middle-school syndrome) in order to have a normal high school life after he was shunned during his middle school years. But just like Godfather III, when he tries to get out, he keeps getting pulled back in. His next door neighbor also had the same over active imagination in middle school, but she has continued her escapades into High School. Inadvertently, she discovers his past propensities and goes on a mission to draw out his true self that he has repressed. They have many awkward and dramatic situations which develop into a budding romance by the end of the first season. I highly recommend watching it. As for the Second Season, it has introduced another character from the main protagonist's past who had an unusually close (by Japanese standards) relationship with the main character and will obviously be the plot mechanism which creates the intrigue this season. As of Episode 4, it is slowly developing, and they are obviously going to use themes of jealousy and relationship problems as the plot in this season. The previous season also had a large amount of plot devoted to their relationship, but the main concept revolved around the crazy escapades of the chuu ni byou high schoolers. After finishing the season, I found myself a little bored with Rikka's repetitiveness. I was hoping for the lovable and energetic rival to depose her, but it was obvious that there was no hope of that by the 8th episode. If you are going to introduce a new rival, don't make her more likable than the main character haha. But nonetheless, it was an interesting continuation of the first season, and I hope they find a way to continue the story. Overall, I have really enjoyed the characters in this show. The plot is mostly about character development while it jumps around having relatively few linear events to progress the dialogue. - no real conflict, sure the new girl adds a new problem of our lovey dovey couple to deal with, but from the very beginning, it is shown that it will not affect the relationship whatsoever, and even dealt with immediately by all the characters. 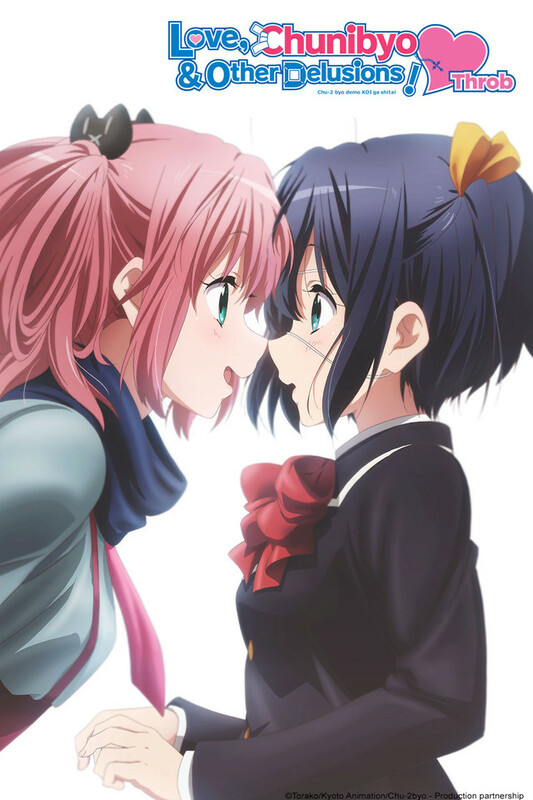 Love, Chunibyo & Other Delusions - Heart Throb - in the nutshell: a cute season that stays faithful to the expectations season 1 laid down, however, does have the problem of feeling more like a miniseries or set of OVAs rather than an actual season. Such an amazing show and instantly one of my favorites; wall-of-text, but an honest review! I rarely find a show in need of a good review because, frankly, most everyone will do it for me. However, I love this show with the passion of one thousand suns! It just has everything you want out of your slice of life anime: it's silly, cute, and heart-wrenching, while also leaving you with memorable characters; something some slice of life shows fail to do. If you really pay attention you will find just how deep this show really is. It's not just about a blooming romance and the crazy situations the cast gets into, it's much more than that. It's about accepting that life goes even if you're not ready to face reality; accepting others for who they are and ultimately accepting yourself with all of your faults; and lastly, it's about finding what makes you happy and sticking to your guns! Life's too short to put on a face for the sake of your peers. Do what makes you happiest and you will find that others will love you even more for just being you. Watch season 1, please, because you won't be disappointed, but remember: the Tyrant's Eye is the strongest! "Love, Chunibyo, & Other Delusions: Heart Throb!" is a wonderful sequel to the entertaining and heartfelt story that was season 1. Now, as a straight man in his twenties, I can honestly say that the ending to the first season made me shed a few manly tears (it may have been slightly more than just a few). That ending was deep, meaningful, and just so darn cute that I bought the first series on DVD right after finishing it. With this thought in mind, what possibly could come after that could match up to the original? Well, for whatever reason KyoAni decided to make 12 more episodes, and I honestly can't thank them enough for that. While "Heart Throb!" may not be the deep love story I would expect coming out of the first series, it IS extremely cute, heartfelt, and entertaining beyond measure. While this second season doesn't do anything truly groundbreaking or new in terms of plot other than adding in a stupid love triangle (which wasn't as bad as I initially would have though it'd be going into it--I'll touch more on that in a bit), it did add more character development to the already great cast from the original, especially in defining Rikka and Yuta's relationship and in deepening the friendship among the "Napping Club" members. More importantly, the creators bring in a new character named Satone, Yuta's childhood friend and ex-chunibyo companion. Satone's appearance does bring in a rivalry atmosphere between her and Rikka, but this anime does not seem to fall too heavily into many love triangle tropes as one would expect. Don't get me wrong, there is still PLENTY of drama in this series, but this anime does tend to shift most of the focus on cute moments between Yuta and Rikka, as well as giving more of the spotlight to Nibutani, Deko-chan, and Kumin-senpai, which is a great thing because all of these characters are so entertaining to watch. Honestly, though, the drama in this series eventually seems to neither jeopardize the ending to the first series, nor does it really add to it. It's like "Heart Throb!" is a 12-episode OVA of sorts. So if you came for more deep and romantic storytelling, you may be disappointed. However, if you want more adorable moments, more chunibyo fight scenes (oh yeah, the fight scenes are back and better than ever! ), and more Dekomori (who doesn't want more Deko-chan? she's quite literally the best character), go watch "Heart Throb!" This second series really does Chuunibyou justice.It's simply beautiful, and I have to admit that I was smiling and cheering just as much as I was cringing during the start of the series. What more is there to say on it? Once you've seen the initial series, you can't help but fall in love all over again with this one. It's one unique love story that I'll always love. One of the best, glad to see it on Crunchy! This slice of life charmed me once again. With a superb atmosphere and lovable characters, Love, Chunibyo & Other Delusions will, for sure, put a smile on your face ! In fact, this second season seems to live up to what I expected from this anime with even more good moments, better animation and a new interesting storyline... As my review's title says, I'm glad Crunchy now has this show! I have to say thought, listening right away to season 2 without watching the first one may make your experience less enjoyable. Therefore, I would highly recommend any newcomer to go watch the season one and to come back here afterward. (Here's a good link to the complete first season of the anime on http://animecenter.tv I borrowed from Laudanum_X's review). For a show with love as the first word in the title, it isn't handled too well. But that problem is only in this season, since at the end of season one the main character's romance was just beginning. Problem is, there's about a six month time jump between seasons; as well as an OVA brining the gap, which I recommend as a fun Christmas episode. Now that means they've been dating for six months, and I do recognize that different people take relationships and love at different speeds. But when you haven't even held hands at half a year of dating, you're not a human anymore. Besides that minor nitpick, this season continues to be a fun and interesting series. One that expands on pre-established characters, all the while introducing new ones. Why would you play me like that?
. AGAIN! Anywho, I give this a 10/10 and I would watch it again.